If you or someone you know has a food allergy, then join us in helping to spread the awareness with our Personalized Take a Safe Bite Food Allergy Awareness Shirt. 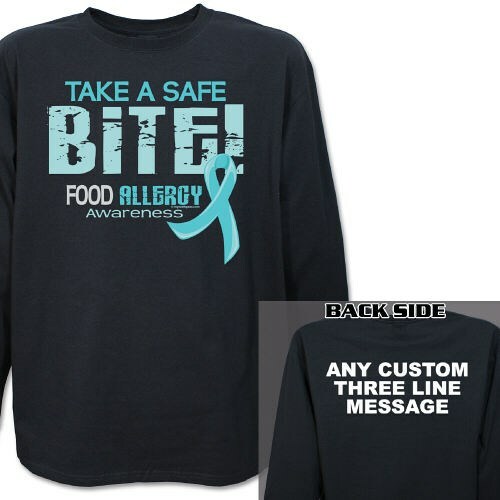 Our Food Allergy Awareness Long Sleeve Shirt is great for giving hope and spreading awareness so that people suffering with Allergies may lead effective and fulfilled lives. Our Personalized Food Allergy Awareness Shirt is available on our premium 100% cotton long sleeve shirt, machine washable in youth sizes S-L and adult sizes S-2XL. Includes FREE Personalization! Personalized your Food Allergy Awareness Shirt with any three line custom message on the back. One out of every 25 Americans has a food allergy. It is estimated that between 150 and 200 people die annually from food allergy reactions or anaphylaxis; including children and young adults. Everyone should take all food allergy reactions seriously and help spread awareness and knowledge for those who have it. Join us by helping with Personalized Food Allergy Awareness Shirts and Walk Gear from MyWalkGear.com. You will find you can help by wearing an awareness T-Shirt, Sweatshirt or Hoodie. Take a peek at our Personalized Food Allergy Awarenss Hoodie and our Personalized Food Allergy T-Shirt as well.